With many banks continuing to dance with death, there’s one bank that is smiling. The Pig’s. The long period of declining savings rate – or an increase in consumer spending – was one of the reasons fuelling the boom that popped not-so-long ago. As over-indebted consumers look forward to an extended period of deleveraging, the US government hopes that with interest rates hovering close to 0%, consumers will be incentivized to borrow and jumpstart the Great Consumption story! Simultaneously, lending norms are gradually being tightened, stoking fears of rising defaults in the near term. The poor Fed can only encourage, but not compel, banks to lend. As consumers mend their profligate spending ways of the past, it looks difficult in the current environment to see either banks lining up to lend or consumers lining up to borrow. Then there’s Bernanke-speak about keeping interest rates low for an ‘extended period’. With nominal rates close to 0% and inflation hovering around 2%, negative real rates of return do little to incentivize saving. The real return on US Treasury bills was >-2% in 2009. 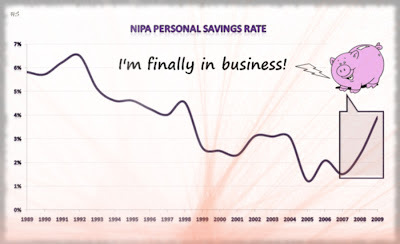 Consumers looking to save were penalized for indulging in frugality! The Fed desires consumers to spend at precisely the moment when they seem most ill-equipped to oblige. So is current consumption a better option? Indeed the Fed and the economy would be happy if this were to happen. While the economic rationale for current spending sounds compelling, I don’t see it happening. High unemployment and the deleveraging cycle is likely to keep spending in check. So if the consumption story is nearly dead and banks are unwilling to open their wallets, what will serve as the engine for future growth? Love the pig! Great writing.